The Nigerian Labour Congress (NLC) has called off the nationwide industrial action initially scheduled to commence Tuesday 06/11/2018, to further press for workers’ demand for new national minimum wage. 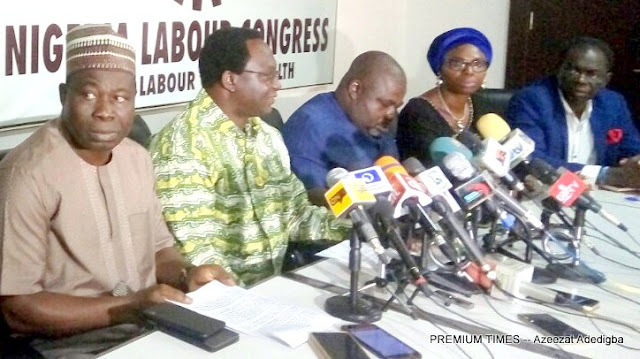 NLC Preident announced this Monday night in Abuja while addressing journalists at the end of a meeting of the tripartite committee set up by government to negotiate labour’s demand. But briefing journalists on Monday night, Mr. Wabba said, “The tripartite negotiating committee this evening concluded its assignment. Agreement has been reached and also documents have been signed. The report will be submitted to Mr. President Tuesday by 4:15pm. Therefore, as organised labour, we want to use this medium to thank all the tripartite partners for their understanding and importantly for concluding this very national assignment. And having reached this position, and also the fact that the assignment has been concluded, organised labour also decided that the proposed industrial action is hereby suspended. Therefore, we thought this should be communicated appropriately without also any delusion or missing information. As the chairperson have said, mutual agreements have been reached and this will be make public tomorrow and we must appreciate the roles that organised private sectors have actually demonstrated and the attitude brought to this process and to members of the tripartite negotiating team.